Lady Sings the Blues Book Group! 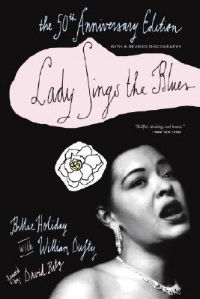 This one-meeting book group will read and discuss Billie Holiday's autobiography, Lady Sings the Blues, in preparation for attending a performance of JAG Productions' presentation of Lady Day at Emerson's Bar & Grill. See the details below, then RSVP if you'd like to join us! With grateful thanks to Kari Meutsch and Kristian Preylowski at Yankee Bookshop, Julia Cooke, and Jarvis Green! Books: Yankee Bookshop will donate $5 from every copy purchased at their store to JAG Productions! RSVP: Use the form below to RSVP so we can have enough chairs and snacks! Thank you! We're looking forward to seeing you on May 15! It’s 1959 and jazz legend Billie Holiday is playing a seedy bar in Philadelphia. It will be one of her last performances. As she shares stories about her stormy personal life, her battle with addiction and her ground-breaking vocal style, she also, of course, sings. Featuring a sensational score, including "God Bless The Child," "What a Little Moonlight Can Do" and "Strange Fruit," this haunting play with captivating insights of the life of one of the greatest jazz singers of all time, is not to be missed. Book group members are not obligated to attend the play, and are responsible for purchasing their own tickets through JAG Productions. Tickets: On sale beginning in March via the JAG Productions website.